MOVING NOTICE / CHANGE OF ADDRESS | Fire Apparatus Journal Inc.
does not notify us of your address change. If you are moving, it is your responsibility to notify Fire Apparatus Journal. Filing an address change form with the Post Office only notifies the Post Office of your new address. You must still notify everyone sending you mail. Each issue of Fire Apparatus Journal is mailed directly from our printer in Pennsylvania in one bulk mailing. This mailing generally takes place during the last week of the month prior to the cover date. An up-to-date subscriber's list is forwarded to the printer so that the envelopes are ready to mail when the magazine comes off the press. Send us your new address in writing at least four weeks in advance. Once the subscriber's list is sent to the printer, there can be no changes made to it. Magazines are NOT forwarded by the Post Office, even if you filed an address change form, unless you make specific arrangements with your local Post Office and guarantee forwarding postage. Undeliverable magazines are often discarded by the Post Office. 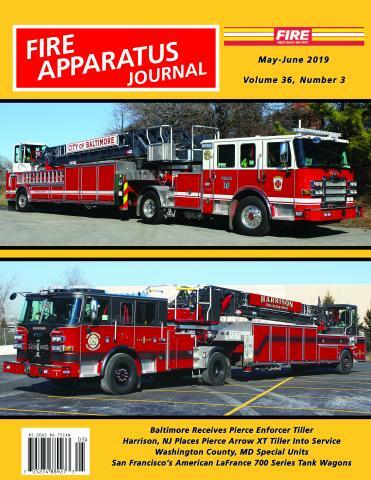 Therefore, if you move and fail to notify us, or we receive your change of address after the subscriber's list is sent to the printer, Fire Apparatus Journal will not be responsible for the delivery of your magazine. If you notify your Post Office to hold your mail for any reason, your magazines may be returned to us postage due (marked Temporarily Away) or may be destroyed under postal regulations. When magazines are returned to us so marked, that subscription is suspended until the subscriber provides us with an address where the magazine can be delivered. In this situation it is likely that you will miss issues. If your magazine is returned to us by the Post Office, we will forward it only after we are reimbursed by you for any postal fees incurred (return postage due and re-mailing fees) as these costs are not built-in to the cost of a subscription. If your magazine is discarded by the Post Office you will have to purchase a replacement copy as a back issue.